Honestly I am always worried when a debut author puts their second book out. I always worry that I am comparing it too much to the first. However, since the first book by Clayton was the first book in this series, I can't help but compare it. And I have to say that the second book didn't work for me at all. I was bored and just kept waiting for something (anything to happen). This book didn't expand the world the reader had found out about in book #1. There was barely any development to any characters. And then things just kind of end with a hint that there may be more to happen with these people in the future. 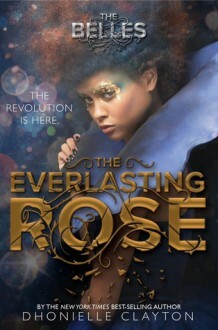 So in "The Everlasting Rose" the second book in the Belles series, we have Camille racing to stop the new evil Queen (Sophia). She and her sisters Edel and Amber managed to get away along with one of the guards, Remy. The group has plans to free the other Belles and rescue the true ruler of the throne Princess Charlotte. I honestly am surprised that Camille seemed even more clueless in this one. I just felt sick and tired of her towards the end. The series should have shown a growth from book #1 to book #2 and we didn't get it at all. I can't even call Camille a Mary Sue since at least the Mary Sue personality is to be perfect and more beautiful than all other female characters for no good reason. Camille was just bland and there. We know she wants to free her sisters and dethrone Sophia, At least there was no love triangle so we just have Camille obsessing over one person which felt like it came from nowhere. The other characters barely have anything to do. Camille spends the most time with Remy and we have her thinking about him, wondering how it would be to kiss him, etc. Edel has more personality than Camille, though we barely have her interacting with Camille (which was weird) besides teaching her how to tap into her powers to change her outside looks and height. Edel doesn't trust Amber or anyone else and she acts like a jerk toward Remy. So Camille's personality was set to jerk, but at least she was lively. Amber was a total non-entity. And the Sophia we read about via the news sounded more scary than what we get in this book. The writing was just okay though I found the flow terrible. There is no sense of magic to me like there was in book #1. I think that this book was too rushed. I would rather have waited another year for more world building and better plotting to be included in this one. It didn't help that each chapter was maybe 4 or 5 pages long. Considering this book was 342 pages (my hardcover) you would think that Clayton would have the main plot be about dethroning Sophia. Sadly we didn't get that until the very end. The setting in this one just didn't work. If Clayton had stayed focused on the Belles maybe. But instead Clayton includes a resistance group known as "The Iron Ladies" who we just read/hear about for long portions of the book. And then Clayton tries to include a whole thing with the Belles being able to tap into their powers to change themselves and I never want to read about how cold a character is again. The book also started to feel repetitive after a while. Camille and friends run and hide, teacup dragons hide in her skirts, she fights with Edel and or Amber, feels angry, and feels jealous about Remy. Lather, rinse, repeat. The ending was a bit of a letdown. I mean we get a Happily For Now ending which I honestly I was fine with because I really can't see this series continuing after this. Beyond boring. Such a letdown after book #1.